Chelsea legend Frank Lampard clashed with Manchester United legend Roy Keane as they squared up in tonight’s Championship game between Derby County and Nottingham Forest. 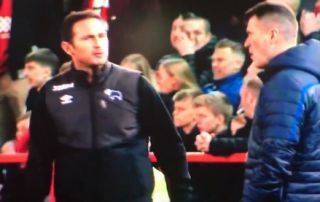 Derby boss Lampard was not happy with Forest assistant Keane, and appeared to go over and shout at him to grow a pair of balls. These two remain a couple of the very finest midfielders to ever grace the Premier League, and it’s great to see them battling it out again as coaches. City legend Frank Lampard telling the rag c*nt Roy Keane to grow some balls.